Stock Interiors is proud to offer the highest quality custom molded auto carpets available. Our automotive carpet molds are created using the original floor pans, so we can guarantee the original fit. 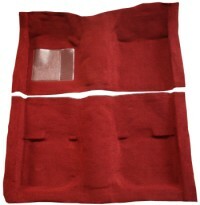 All of our auto carpet kits are made with high quality replacement auto carpet, correctly molded to the actual vehicle floor pan, over 70 Color Options to chose from, heel pad is welded in the correct location (in most cases), jute padding included with the carpet and optional Mass Back upgrade available ( What is Mass Back?). Our Custom Molded Auto Carpet items have 1413 ratings with an average score of 4.84 out of 5 stars. When installed, our custom molded auto carpets will make your vehicle look just like new again!